New Item! Expected to Ship 05-15-2019. Earn up to 2,080 reward points. Add some awesome tone and projection to your rig with this rugged 1x12". Since their launch in 2010, Blackstar's HT-1 and HT-5 tube amps have become one of the world's best-selling tube amp lines. The updated MkII version of these acclaimed amplifiers elevates them to a new level of performance. This 1x12 speaker cabinet is perfectly matched to complement the HT-1RH MkII, HT-5RH MkII & HT-20RH MkII. 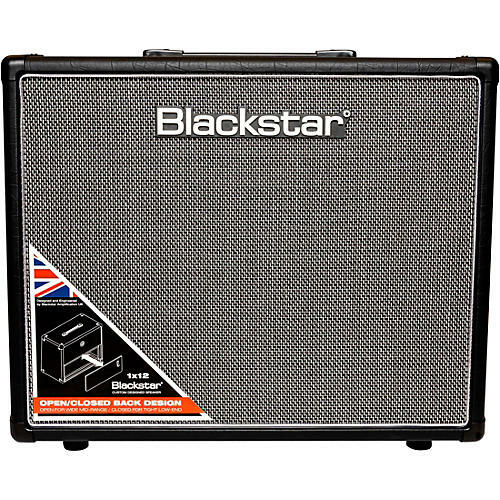 The Blackstar HT-112 Mk II speaker cab delivers awesome tone and projection. These cabinets use heavy-gauge wiring and rugged construction for strength and tone. Inside, a single 12" specially designed 50 Watt loudspeaker give this cabinet its voice. The HT-112 Mk II also features a unique open/closed back design, which allows players to choose their cabinet configuration. Compact and lightweight, this cabinet is perfect for HT MkII amps.